 A soundly researched and lucidly written survey of the daily emotional experience of mothers, fathers, and adolescents in 55 European-American working- and middle-class families. The book is based on an innovative study in which fathers, mothers, and teenagers were equipped with beepers that went off at regular intervals throughout the day, at which point they stopped whatever they were doing to record their activities and feelings. This procedure allowed Larson (Human Development and Family Studies/Univ. of Illinois, Urbana-Champaign) and Richards (Psychology/Loyola Univ.) to explore the connections between the family's interactions and each member's emotional experience outside the family. The authors found that families with adolescents were healthier when mothers' lives outside the home (school, career, social life, etc.) were richer and when fathers' work was less stressful. 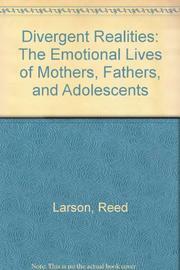 Larson and Richards observe from the study's results that the traditionally gendered roles of parents can hinder them from adapting smoothly to a child's transition into adolescence. A mother who identifies too strongly with her maternal role may complicate her teen's need to separate. The father's traditional insistence on maintaining authority insults a teenager's growing need to have more control over his or her own life. Yet at the same time, teens are becoming particularly aware of their own feelings and needs to feel understood by the adults in their lives, needs that are further frustrated by a father's emotional distance. The more both parents' behavior, especially the father's, deviates from narrowly defined gender roles, Larson and Richards find, the better their relationships with their adolescents tend to be. A valuable contribution to family studies, this is also a sensible and creative survival manual for parents of adolescents as well as mental health professionals who counsel families.